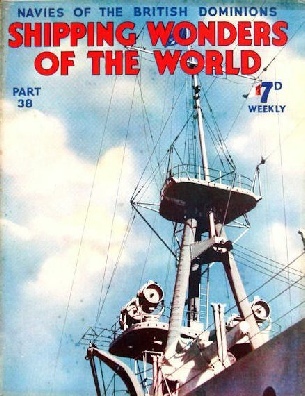 Part 38 of Shipping Wonders of the World was published on Tuesday 27th October 1936. 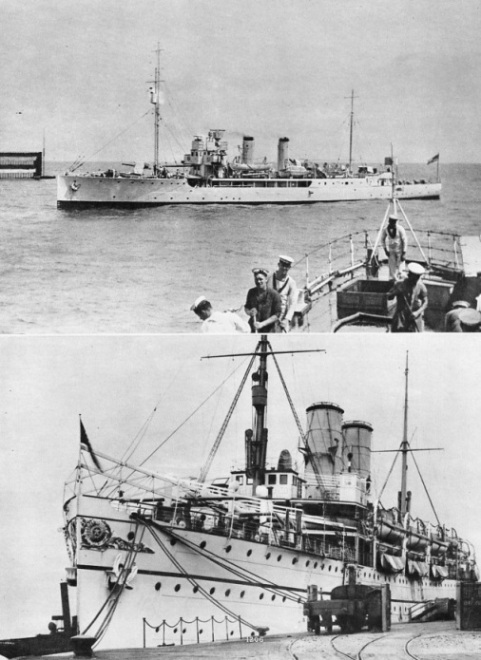 It included a centre photogravure supplement featuring the Navies belonging to the British Commonwealth of Nations, which formed part of an article called In the Dominions. This week’s cover shows an American ship fitted with four Sperry 36-in high-intensity searchlights. Each has a beam candlepower of 387,000,000. Given normal visibility, such a searchlight would pick up clearly a small boat on the horizon 17 to 20 miles away. For the photograph on which the cover is based I am indebted to the Sperry Gyroscope Company, Limited, and to R I Nesmith and Associates, of New York. Concluding section of this article from part 37. This part includes the tale of the Ethel and Millie, one of the most moving and inspiring of all the “Mystery Ship” stories. NOW A PLYMOUTH TRAWLER, the Treminster (shown left) was formerly a Brixham, Devfonshire, vessel. During the war of 1914-18, she emulated the exploits of the famous Lowestoft and North Sea “trap-ships” and had a fine record as a sailing Q-ship. THE NORTH-EASTERN FRONTIER of the Belgian Congo is marked by Lake Albert, where this photograph was taken. From this lake flows the mighty Nile. Thus, two of Africa’s navigable waterways serve an area extending from Banana, at the mouth of the Congo, to the Mediterranean. 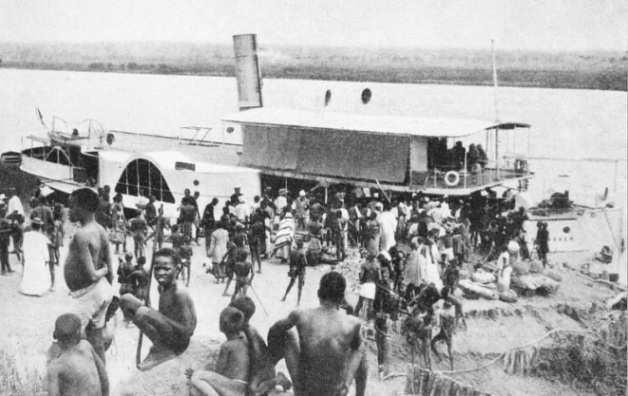 As at most places in the Congo system, the arrival of a steamer brings out almost the entire population. On the Congo itself one company alone, the Unatra Company, has river steamers amounting to a total of more than 50,000 tons deadweight. the series The Navy Goes to Work. The River Congo and its numerous tributaries form the only means of transport through thousands of miles of central Africa. Where navigation is obstructed by rapids and gorges, railways connect the navigable sections of the river. Sir Henry Stanley is famous as the originator of a phrase that has gone down in history - “Doctor Livingstone, I presume?” His discovery of the lone pioneer and missionary is one of the most extraordinary in the history of exploration. But Stanley deserves recognition for greater achievements than the mere coining of a phrase. It was he who, when Africa was really “the Dark Continent”, took his life in his hands to explore the River Congo. This chapter is by Sidney Howard who tells the story of the exploration of the Congo by Stanley and by the men who came after him. This is the fourteenth article in the series on World Waterways. 472 ft 6 in, a beam of 46 ft 6 in and a mean draught of 14 ft 3 in. A turret and forward gunhouse are among her chief characteristics. 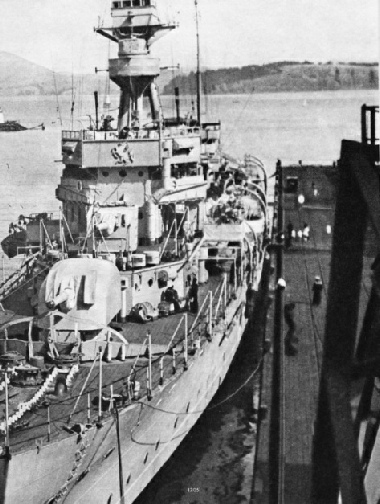 The Rangatira, 6,152 tons gross, has a length of 405 ft 1 in, a beam of 58 ft 2 in and a depth of 25 ft 9 in. She belongs to the Union Steamship Company of New Zealand. An immense amount of careful and skilled work goes into the making and revising of the various types of charts upon which mariners depend. In the year AD 150 the cartographer Ptolemy drew a map of the world which for fourteen hundred years was regarded as the standard authority. A reproduction of Ptolemy’s map appeared in the first part of Shipping Wonders of the World. For more than a thousand years the art of charting and mapping stood still - or perhaps I should say it went back, for some of the productions of the Middle Ages were far less accurate than Ptolemy’s map. In the sixteenth century Gerard Mercator invented his system of projection, which is still used to-day. Mercator’s projection overcame one of the greatest difficulties of early cartographers - that of presenting the earth’s curved surface on a flat piece of paper or vellum. Nowadays the charting of coast-lines and of the ocean bed is a specialized science. This chapter by F A Bex gives a brief note on the historical aspect of the subject, describes the methods by which surveying ships do their work, and gives an account of the Admiralty charts. The chapter is illustrated with a simplified reproduction of a portion of one of these charts and, with the aid of this, the author conducts the reader on an imaginary voyage from Dover to Dunkirk showing how reference to the chart enables the mariner to circumvent the various shoals and sandbanks. OCEANOGRAPHICAL OBSERVATION of every kind is carried out by HM survey ships to obtain data from which charts are drawn up. In HMS Challenger, for instance, special bottles (left) are carried to obtain samples of water and recordings of temperature from depths as great as 24,000 feet. A special type of winch is used for bringing these bottles and other oceanographical instruments to the surface. HMS Challenger, 1,140 tons displacement, has been doing valuable survey work since 1931. 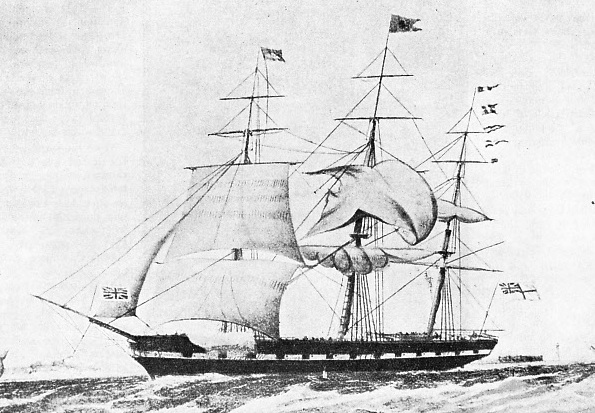 Foredoomed to failure in the eyes of the critics because of her ugly appearance and clumsy lines, the clipper ship Marco Polo proved to be one of the fastest vessels of her time. Though there are cynics who remind us that beauty lies in the eye of the beholder, few will dispute the aesthetic claims of the sailing ship. About the beauty of the most famous sailing ships of the past there was no dispute; but there were one or two whose lines seemed awkward and ill-proportioned. 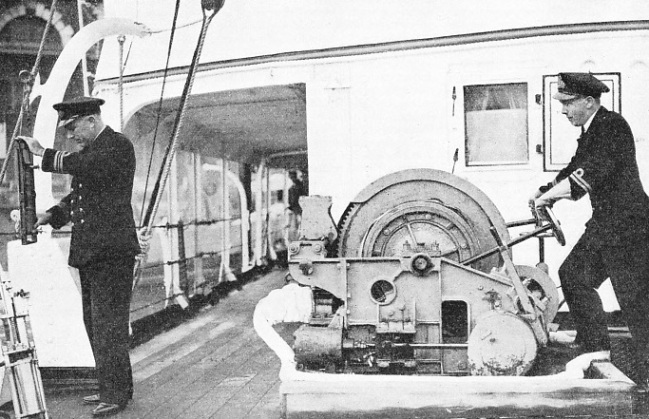 Such a vessel was the Marco Polo which Frank Bowen describes in this chapter. Ugly though she was, she set up records which won for her the admiration of the shipping world. In spite of the jeers of critics, her builder was confident of her capacity for speed, and he was proved to be right. The strange thing is that later ships which were built as exact replicas of the Marco Polo were never successful. Her first captain was James Forbes, “Bully” Forbes as he was called, and he was as dramatic personality if ever there was one. Without money or influence, his only assets were courage and ambition, backed by real ability. Under him, the Marco Polo made several exceedingly fast passages, which made the reputations of the captain and of the ship. This is the seventh article in the series Speed Under Sail. AWAY SEA-BOAT! A boat being slipped from the falls during manoeuvres of the South African Squadron. A naval base and a dockyard of considerable importance are maintained by the Union of South Africa at Simonstown, near Capetown. 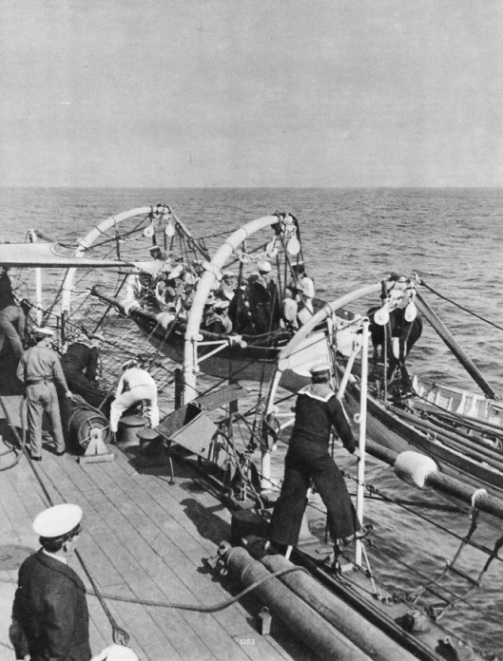 The South African Naval Service, however, was disbanded in 1934 when the minesweeping vessels Immortelle and Sonneblom, now Eden and Foyle, were returned to the Royal Navy. The South African Squadron of the Royal Navy is based at Simonstown. AN AUSTRALIAN CRUISER of 9,850 tons displacement, the Canberra was built by John Brown & Co. Ltd, Clydebank, and completed in 1928, with her sister ship Australia. Geared turbines of 80,000 horse-power give these quadruple-screw vessels a speed of more than 31 knots. They are armed with eight 8-in, four 4-in anti-aircraft and twenty smaller guns. They have, in addition, eight 21-in torpedo tubes in quadruple mountings. EXERCISES IN HAURAKI GULF, New Zealand. 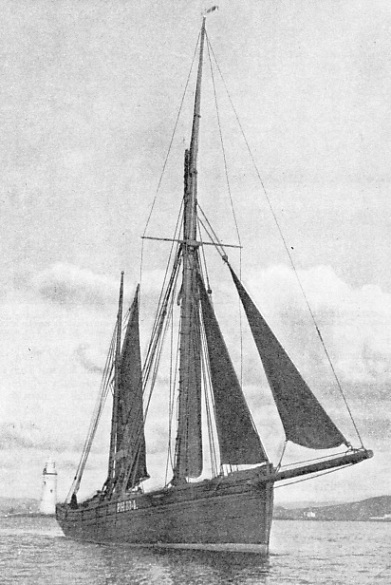 This photograph of the sloop Veronica was taken from the deck of the New Zealand cruiser Diomede, illustrated on page 1205. In the background on the left a battle-practice target can be seen. The Veronica, completed in 1915, was a sloop of the “Flower” class, with a displacement of 1,200 tons. She had a length of 250 feet between perpendiculars, a beam of 33 feet and a mean draught of 11 feet. A ROYAL INDIAN MARINE TROOPSHIP, built at Clydebank in 1907. The Northbrook was a vessel of 5,820 tons gross, and this photograph shows her at Southampton. She had a length of 360 feet, a beam of 51 ft 9 in and a depth of 18 feet. In October 1934 the Royal Indian Marine became the Royal Indian Navy. ONE OF THE UGLIEST SHIPS BUILT, the Marco Polo surprised the world with her speed. Launched at St John, New Brunswick, in 1851, she had a registered tonnage of 1,625. The Marco Polo had a length of 184 ft 1 in, a beam of 36 ft 4 in and a depth of 29 ft 5 in. These dimensions differed slightly from those projected before the ship was built. 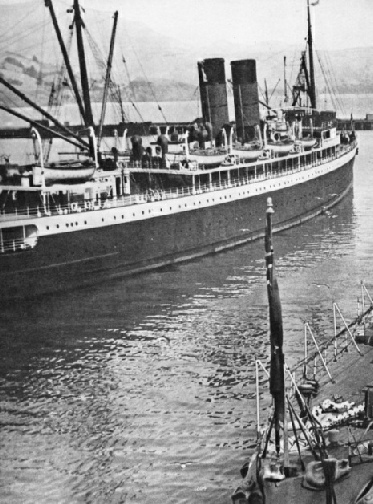 Accompanied by his wife and later by his young son and a dog, Erling Tambs sailed a 40-feet cutter, the Teddy, from Norway to New Zealand where his daughter was born. Erling Tambs, a Norwegian poet, refused to be circumscribed by the limits of a conventional existence. His wife, fortunately, was of a similar mind, and together they sailed off in a small yacht. After many adventures, disaster finally overtook the cutter, but the whole family was saved. This chapter, by Sidney Howard, begins their story, which is concluded in part 39. It is the eighth article in the series Great Voyages in Little Ships. 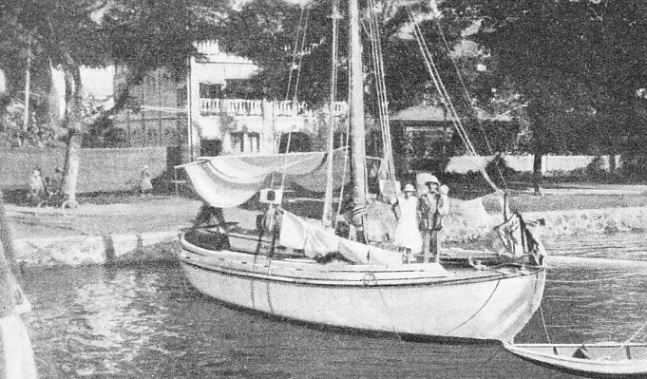 IN PAPEETE HARBOUR, Tahiti, the Teddy was moored stern-on to the embankment. The soft wood of the cutter shrank so badly in the strong Tahitian sun that when Tambs left the harbour the Teddy nearly foundered. Water poured in through the gaping seams and Tambs only just managed to get her across to a harbour in the neighbouring island of Moorea.